GUARANTEED TO BE GENUINE ANTIQUE AND OF THE PERIOD STATED. Made in Moscow between 1908 and 1917. Ring is designed to have a rough look of an ancient ring. The decorations of the ring are stylized in Middle Eastern traditions. And resemble ancient chased ornaments. The matte surface finish imitates oxidized ancient gold. The ring is centered with a round sparkling Old European cut diamond - 7.5 x 7.6 x 5.0 mm, approximately 1.90 ct. 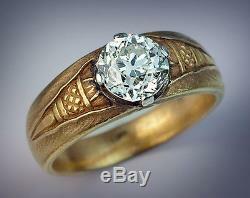 The ring is marked with 56 zolotnik old Russian gold standard (14K) / Moscow assay office. Weight - 9.4 grams. US ring size 9 3/4 (20 mm). The item "Vintage Russian Solitaire Diamond Gold Men's Ring" is in sale since Thursday, September 15, 2016. This item is in the category "Jewelry & Watches\Vintage & Antique Jewelry\Fine\Men's Vintage Fine Jewelry".com" and is located in Chicago, Illinois.